TMCnet, a global, integrated media company helping clients build communities in print, in person and online, announced that the Wholesale VoIP channel, sponsored by VoIP Innovations, has been launched as the newest addition to the TMCnet Online Community program. TMCnet is the leading Website for communications and technology professionals. TMCnet is visited by 1.5 million unique monthly visitors and generates more than 60 million page views every month, according to Webtrends. TMC is celebrating its 40th anniversary as a global, integrated media company that helps clients build communities in print, in person, and online.TMC publishes the TMC's CUSTOMER Magazine (formerly Customer Interaction Solutions), INTERNET TELEPHONY, Next Gen Mobility, and Cloud Computing magazines. TMCnet.com, which is read by 1.5 million unique visitors each month, is the leading source of news and articles for the communications and technology industries. TMC is the producer of ITEXPO, the world's leading B2B communications event. In addition, TMC runs multiple industry events: Cloud Communications Expo; Cloud4SMB Expo; CVx (ChannelVision Expo); DevCon5; HTML5 Summit; LatinComm Conference & Expo; M2M Evolution Conference & Expo; Mobility Tech Conference & Expo; MSPAlliance MSPWorld; StartupCamp; Video World Conference & Expo and more. For more information about TMC, visit http://www.tmcnet.com. VoIP Innovations is based in Pittsburgh, Pa and provides wholesale VoIP services to Carriers, ITSP's, Calling Centers, Calling Card Companies and SMB/Enterprise. These services include VoIP Origination, Termination, Toll-Free, 411, e911 (News - Alert), Caller ID, CNAM and more. VoIP Innovations was recently awarded #744 on the 2012 Inc. 5000 list and #12 on the Pittsburgh Business Times 100 List of Fastest-growing Pittsburgh-area Private Companies. 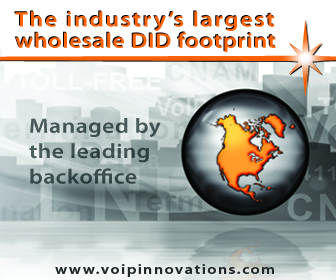 For more information about VoIP Innovations, visit http://www.voipinnovations.com.